After the Allies invaded Italy in 1943 they came at a halt at the Gustav Line at Cassino. Once they realized that they won't be able to penetrate it the commander of the Allied forces in Italy began thinking about alternatives and what he could do. A suggestion from Winston Churchill was that they launch an operation that would move forces behind the Gustav Line at Anzio that would result in what we all know today as the Battle of Anzio. 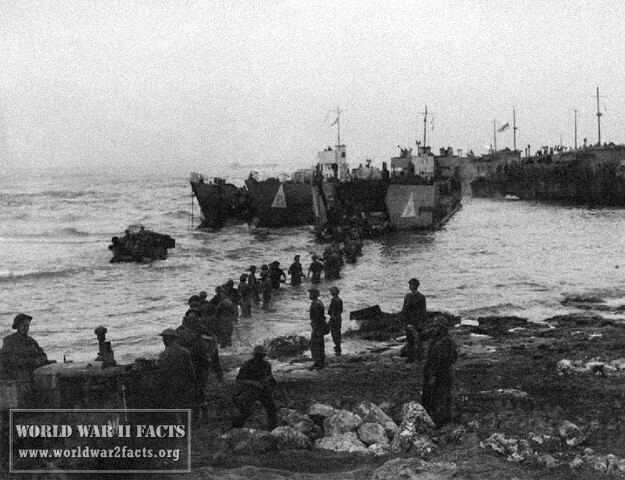 The battle would be the fighting that resulted after the Allies conducted an amphibious landing in the area of Anzio known as Operation Shingle. The battle took place between January 22nd, 1944 and June 5th, 1944. While the U.S. military ignored the suggestion at first it was later adopted after Churchill talked to President Roosevelt. 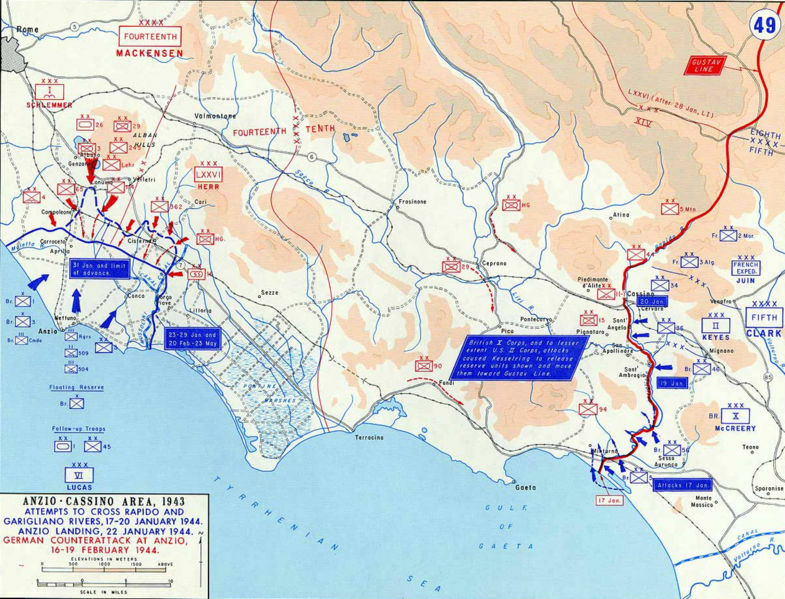 The plan was for the US Fifth Army to attack the Gustav Line and in doing so draw the opposing forces south while the VI Crops land at Anzio. 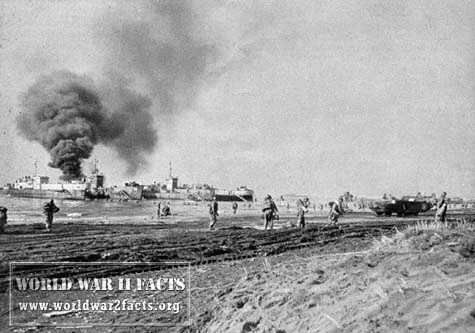 A big problem with the plan soon emerged, the orders given to the commander of what would become the battle of Anzio didn't reflect the real urgency of the attack. His orders were to plan the attack flexibly, this was probably because General Mark Clark didn't have much faith in the operation, he thought that for an operation like this to be successful more forces were required, at least a full army. The commander heading the operation, Major General John P. Lucas share the same view as he thought that he was being sent into battle without enough forces. 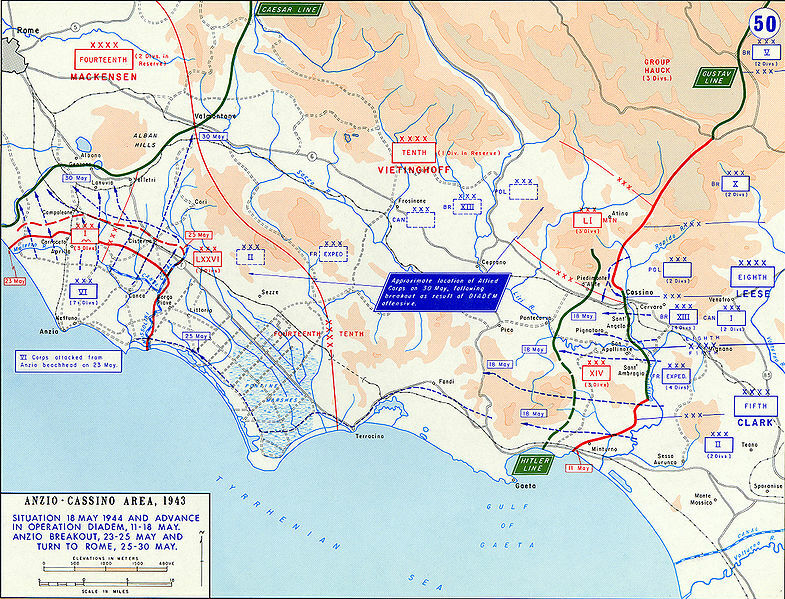 The Allied breakout from Anzio and advance from the Gustav Line May 1944. Area of operations, late May 1944. Despite the reservations of the senior commanders of the operation it was launched on January 22, 1944 with the British 1st Infantry landing on the north, the 3rd US Infantry on the south and the 6615th Ranger Force attacking the port. When they first landed the Allies didn't find much resistance and this allow them to secure a big beachhead (about 3 miles deep) but instead of moving quickly to attack the Germans, Lucas waited wanting to first secure the perimeter to the annoyance of Alexander and Churchill. While most people believe that Lucas should have tried to gain more ground and attack further inland his caution wasn't without merit, he did far a superior force. When the Germans got wind of the Allied landings they took immediate action. They sent a mobile reaction unit in first and then an additional 6 divisions. 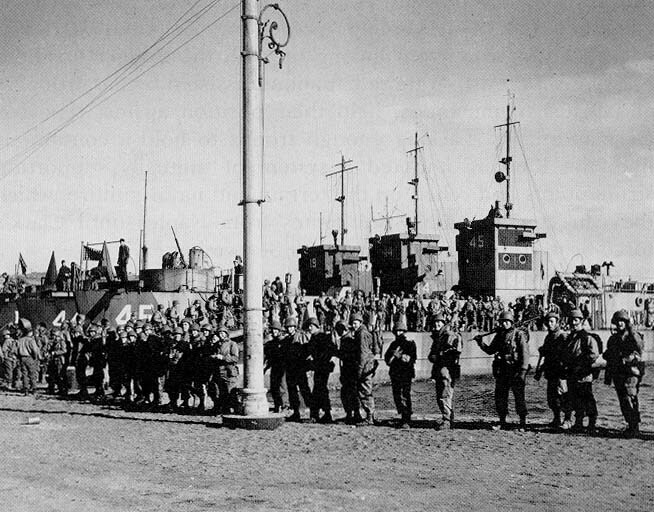 On January 24 Lucas had a force of 40,000 men and the battle of Anzio would soon begin. heavy losses but the British gained some ground at Via Anziate but ultimate couldn't take the town. By February the German forces outnumbered the Allies and attacked their lines with the first goal of driving them out of Via Anziate. After a few days of heavy fighting they pushed the British out of the ground they had gained and by February 16th the Germans attacked again and pushed the Allied forces all the way back to their beachhead. After a change of command offensive operations were suspended until spring and during that time a new defensive line was created between the beachhead and Rome. In May a new offensive way prepared and it's first move was to trap the German Tenth Army and the second would be to advance through Albano to Rome. After a few successful battles which resulting in the fast advance of the Allied forces hey were given orders to divert their attack to Rome and marching on Valmontone with a weaker force. The Germans were quick to exploit the sudden slowdown in Allied advance and because of this the Allies weren't able to make an attack on Rome until May 29. When they arrived at the front lines of Rome the Allies exploited a weakness in the German defenses and soon marched into the city and this was the end of the battle of Anzio. 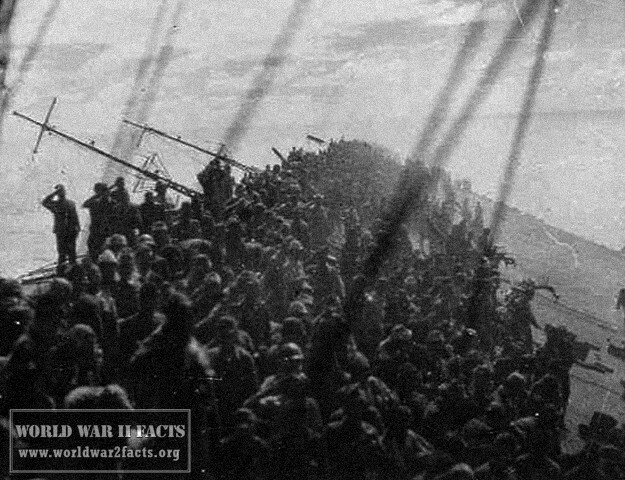 At the end of the bate the Allies lost around 7,000 soldiers and an additional 36,000 were wounded or missing. The Germans had around 5,000 dead, some 30,500 wounded or missing and 4,500 were captured. Even though the campaign was a success years later it was criticized for it's poor organization and execution. While Lucas should have been more aggressive in the execution of the plan his force was small, especially when one considers the task he was given to perform. Many people also blame Clark for his change of strategy during Operation Diadem which led to the escape of the German Tenth Army, because of this escape the Tenth Army continued to fight in battles for the rest of the year. 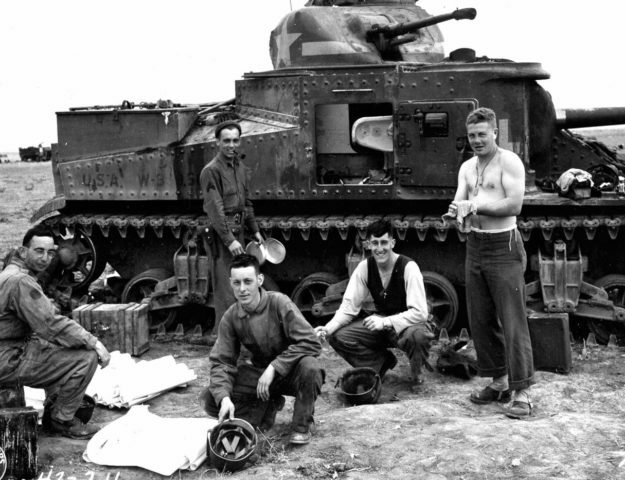 Despite being heavily criticized Churchill always defended the battle of Anzio, with the reasoning that even though the operation failed it proved to achieve tactical goals and it was successful in holding the German forces that were in Italy from reaching Normandy. Kappes, Irwin J. (2003). "Anzio — The Allies' Greatest Blunder of World War II". militaryhistoryonline.com website. Last accessed April 10th, 2013. Anzio Beach head - contemporary film footage, last accessed April 9th, 2013. The Battle for Anzio - Woodruff, William, last accessed April 10th, 2013.